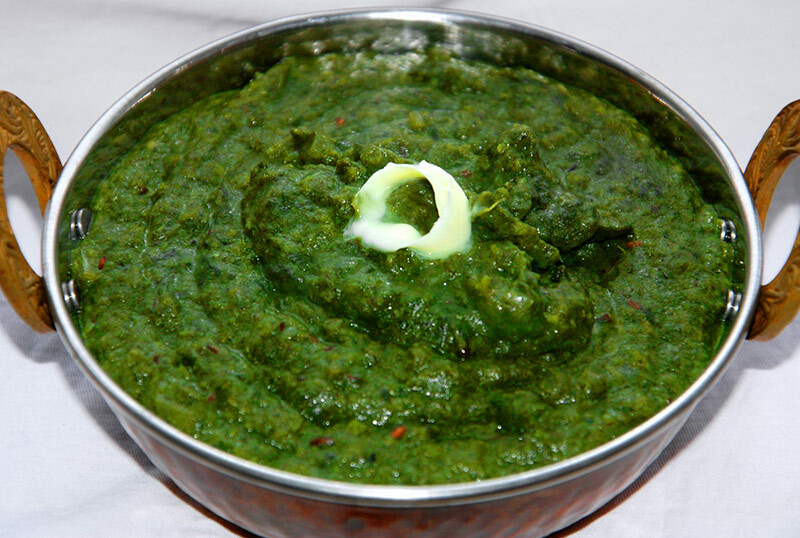 Mention Sarson ka Saag to any self-respecting Punjabi and they will become nostalgic about the last time they ate it. Mustard green fields have somehow become identity of Punjab villages, but even I get transported to open fields of mustard greens, yellow cornmeal breads and fresh, homemade white butter… It is rich, so we don’t eat it often – mostly for Sunday lunch so that there is time to digest it over the afternoon! Our Indian recipe list will not be complete without it. Meanwhile, heat the ghee, or butter and oil, in a large non-stick saucepan. Add the onions and a little salt and sauté until browning, around 10 minutes. Reduce the heat to low, add the ginger and garlic pastes and continue to sauté until these are cooked and colouring; another 1–2 minutes. Add the tomatoes and sauté for 5–6 minutes, then follow with the spices and a little more seasoning and cook until the masala releases oil into the pan, around 10 further minutes over a medium heat, stirring often. While the tomatoes are cooking, blend the cooked greens until smooth and add to the cooked tomatoes along with the contents of the can. Bring to a simmer, cover and cook for 15 minutes. Meanwhile, heat the ghee, or butter and oil, in a large non-stick saucepan. Add the onions and a little salt and sauté until browning, around 10 minutes. Reduce the heat to low, add the ginger and garlic pastes and continue to sauté until these are cooked and colouring; another 1–2 minutes. While the tomatoes are cooking, blend the cooked greens until smooth and add to the cooked tomatoes along with the contents of the can. Bring to a simmer, cover and cook for 15 minutes. Add the cornmeal and jaggery and cook for another couple of minutes, then serve with a little knob of butter, sprinkled with the julienned ginger.